This entry was posted on January 3, 2014. Bookmark the permalink. Your child comes home from school and wants a snack before starting homework. And, maybe, a few more minutes to unwind. And perhaps a quick video game. Then, while you are making dinner (and distracted), you hear the TV from the other room. By then, it’s almost dinner time and it’s easier to wait until after everyone has eaten to have the kids start doing their homework. Before you know it, dinner is long over and the homework still hasn’t been taken out of the backpacks. And then it begins. Your voice escalates, you child whines; you cajole, your child resists; you get angry, your child becomes defensive. Not only are you aggravated and frustrated, but your child has successfully avoided any chance of benefitting from at-home practice of the skills learned at school. And the teacher misses the opportunity to assess your child’s comprehension of the materials. Everyone loses. Homework serves many purposes, but there are two that I find most compelling. First, when teachers establish clear expectations, it sets students up to develop good work habits and learn responsibility for their schoolwork. Second, the teacher has the opportunity to assess each student’s mastery of the material and address any areas of weakness before they become problematic. Neither of these goals can be accomplished if homework turns into a knock-down, drag-out fight every night. Here are a few suggestions to take the headache out of homework. 1. Set up homework time. Some children work better right after school. Some need time to unwind and work best after dinner. Figure out what works for your children and make that part of their regular schedule. 2. Establish homework headquarters. This should be a well-stocked, well-lit, distraction-free area that is conducive to focus and concentration. If the dining room table or the kitchen island make the best homework spots, assemble a homework caddy that contains all the necessary supplies and is easily accessible. 3. Make a plan. 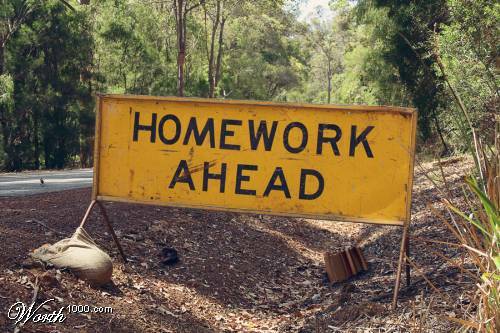 If it’s a heavy homework night, help children prioritize their work so they don’t get burned out or frustrated. Build in breaks and set a timer. If it’s a heavy homework week, do the same over the course of the upcoming days. Use a calendar and work backwards so that the work is done over a series of nights and culminates the night before it is due. Use a highlighter to mark the assignment on the day it is due. After your child has the hang of it, let them tell you how they would attack their workload. This will not happen overnight. You need to be available to check in with them as they learn how to manage time lines and due dates. When you think they can manage their homework on their own, encourage them to take charge. But keep a close watch and check in periodically to make sure they stay on track. 4. Give positive feedback. When your children handle their homework responsibly and do their best work, tell them! Let them know they are doing a great job and they should be proud of their hard work. Rewards that can be earned by demonstrating responsibility and independence are often effective ways to encourage these desired behaviors. Take your children to a movie or let them choose a special activity (bowling, painting) as a way to celebrate their efforts. 5. Be patient. It may take some time to develop these new habits, but stick with it. With some planning, organization and positive reinforcement, homework will cease to be a source of aggravation and will instead become a source of pride and accomplishment for your children. Wishing you and your families a happy and healthy 2014!